Miami is rich in diversity and offers vacationers far more than most large metropolitan areas. This home is in the middle of it all. 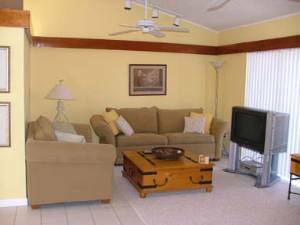 Kick back and relax in your private the pool or take a ride to one of the nearby attractions. From Miami Beach to (South Beach 20 minute drive)to the Everglades to the Florida Keys, most everything you might want to do is less than 45 minutes from this house. Our two unique national parks, Everglades and Biscayne, are internationally recognized treasures and are not to be missed. Snorkel over the only coral reef in continental U.S.A. and watch the colorful tropical fish at nearby Pennekamp State Park. Visitors can spend their days experiencing our wonderful sandy beaches, boating and fishing on the ocean, sheltered bays, or inland waters. Fairchild Tropical Gardens is one of the world's preeminent botanical gardens. Metrozoo is one of the world's great zoos where visitors can experience animals from over the world in a cageless environment. Enjoy the races at the Homestead Speedway, gambling at Calder and Gulfstream Racetracks, and the Miccosukee Indian Reservation. Visit the Miami Seaquarium and the Parrot Jungle or enjoy sports events at Pro Player Stadium, the Orange Bowl Stadium, or the American Airlines Arena. World famous Sawgrass Mills Outlet Mall with interesting restaurants, great entertainment and seemingly unlimited stores is only one hour away, as are the Sunrise Musical Center and the Broward County Stadium. Miami has subtropical weather with warm, sunny winters. The birding is outstanding during the spring and fall migrations. If you are really adventurous and plan to camp in the Florida Everglades or spend a few days at Disney World or in the Key West area or want to spend a few days in the Miami area before and after a cruise, we may be able to accommodate you by splitting your week into two parts if scheduling permits (Additional cleaning charges may be required to split dates). Talk to us, we are flexible. Safe residential neighborhood. Landscaped yard.All new pool furniture, patio bar,Gazebo. newly landscaped. High speed DSL and computer with printer, safe, 5 gallon bottle water and cooler, Gas pool heater, are available at additional charge. We stayed in March 2009. We had a fabulous stay. Accommodations were A +. We couldn't have found a better place to stay and make our home for the week. Absolutely loved the pool in the back yard. Incredibly spacious, wonderful cooking kitchen. Quiet neighborhood. Definitely a memorable trip made because of the house, location, helpfulness of owner. We want to go back one day and enjoy Florida again. My husband and I throughly enjoyed the home. It was very relaxing and confortable. The pool and outside area were very private. We enjoyed swimmiing and cooking on the outside grill. JOE was an exceptional host and always available when you called him for directions, repairs,sites to visit, resturants. We plan on coming back. Beautiful home and beautiful location. Just want to say we had a fantastic time staying at this villa. A real home form home expirience. The area is quiet and around an hour to south beach but is nearer to the Keys. You will definetly need a car to get around. The owner Joe is next door and to hand when you need him and you literally just have to take yourself and your clothes and the villa provides everything you need including your toothbrush and all toiletries.The BBQ was fantastic which meant that the men did all the cooking!! Last but not least the villa has a very big pool which kept the kids amused all day. If i have the opportunity again i will go back to this villa. From the moment we arrived at this lovely holiday house we felt very much at home. Joe, the owner lives next door, was very helpful and available anytime in case of problems or questions. The house is spacious, clean and nicely furnished. We loved the big pool within the private garden and had a dip every day. There are sunloungers and plenty of chairs, no need to bring your own beach towels, everything is there-from suncream to shampoo, even mosquito spray. The kitchen is well equipped, we especially loved the smoothie maker to make cocktails to sip by the pool in the sunshine! The neighbourhood is quiet, the supermarket just a short drive away. There is plenty of shopping in the area, Miami Beach and the Everglades are within 1 hours drive. Don't miss to visit the Floria Keys, which are a group of island in the south. Key West is 3.5 hours by car and absolutely worth a visit. In the house there is a lot more information about what to do and where to go. Thanks again Joe, we had a great holiday and would definetely recommend your place to others! Loved oue stay. Villa is propertly located for all major sites and ths Keys. J oe is the perfect host-even loaning us his sat-navigation for driving during the duration of our stay. We had a great time.Pool warm, Central A/C ina all of the house. Barbeque was easy to use. You have lots of space in the house. Friendly welcoming by Joe and hr very helpful. The childrem enjoyed it a lot . It is a safe neighborhood . We will be back. What a fabolous weekend! We had a a wonderful time in Miami , mostly due to our accomadations. We could of not of had a more wonderful house or a more gracious host. The pool and entire backyard were especially a dream. Thank you so much, Joe. We can't wait to come back again. Stayed at this home with two little kids for a week and can't complain about anything. The pool was the best. 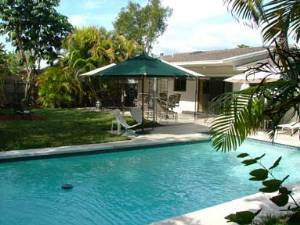 This property is a great location for those who would like to see the Miami area or just hang out at the house around the pool. The kitchen has everything you need to make all your meals and plenty of room for everyone to join in. The lay out of the home is great giving everyone the space the might need. It is great having Joe next door as he is just a phone call away to assist you with any advice you may want about local attractions and or directions. The pool is so nice to come home to after a long day of site seeing. Just bring your bathing suit and clothes because everything elss is supplied! Thanks Joe! We gals had a truly great time! We will be back! We throughly enjoyed the roominess of the house. The availability of the owner, pool and poolside furniture. We easily adjusted to the house and felt right at home here. Joe models what service shouls be like in hotels, motels, rental units and the like. March 2, 2008 Reviewer: Sarah Bergakker From: Rayal Oaks MI. February 13, 2008 Reviewer: Tracy Barton From: Lake Oswego, OR. All of us are very pleased to be here. We had a great time in a relaxed atmosphere. Great time with BBQing-swinmming-ect. We want to say many thanks for your patience and courtesy- you are a very great man. Thanks a lot Joe-We appreciate!! !and we hope you will be our guest in Italy. Thanks for the great stay. Joe, Thanks so much for making my family stay enjoyable. We look forward to coming back soon. Sorry for just getting around to visiting your guest book. We had a wonderful time at your lovely place in August this year. My children and grand children did not want to leave so after one week. We thoroughly enjoyed everything, especially the pool and the washer and dryer. Your place was so clean just the way we keep ours at home. We plan to return in again this summer. As soon as we know the exact dates, we will finalize our stay. Thanks for your hospility and that of your lovely wife. You both made our stay very memorable. Homeowner Response: Thank you for your business and we are very happy you and your family enjoyed themselves. Looking forward to seeing you again. October 7, 2007 Reviewer: Sam and Crissi Boyer From: Robertsdale AL. Joe-Thanks for everything. We will be back! Great Movie choice for us, thanks fopr the garlic-you rock! The house has everything-you could want. Can't wait to bring the kids and enjoy it more. forward to returning in the future. Thank you, Joe! had a great time in this home the home had everything you could possibly need. very comfortable and the kids enjoyed the pool. nice, relaxing and quiet getaway. The pool was enjoyable, along with all the great patio furniture. Nicely furnished in Miami style. Appreciated the laundry machine and hot showers! Wow, what a great location, house and owner. 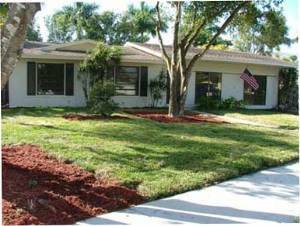 The house is very comfortable with everything one would want, is clean and has an inviting yard, patio and pool. The bed is very comfortable. We felt very welcome. Thanks Joe, for sharing this great enighbourhood home with us. May 10, 2007 Reviewer: K C Lancaster From: Northglenn, CO.
Joe is a very nice man. The house and the kitchen are well-eguipped, the swimming pool is clean. Bátran írjatok, Joe nagyon korrekt, kedves ember. The elegance of this home is exceeded only by the owner's commitment to total customer satisfaction. If there were more people in the world like Mr. Scascia, there would be no need for complaints departments. If you are planning to vacation in S. Florida, you will not do any better than this! January 26, 2007 Reviewer: Bernard Gips From: Brooklyn, NY. We had a wonderful time, mostly enjoying the private pool and comfortable beds. Also loved the short drive to Fairchild Gardens, Coconut Grove & Key Biscayne via Old Cutler, just charming; and, the shortened drive to swim with the dolphins down in Key Largo. Excellent positioning. Thank you, again. See you, I hope, in the not to distant future. January 8, 2007 Reviewer: Keith Vroman From: Murfreesboro, TN. This rental was our home away from home for our whole family while we attended a wedding in Miami. The kids loved the pool & the yard, the adults loved the patio, grill & all of the comforts of home. Joe has thought of everything from toiletries, to dishes, spices & paper products. 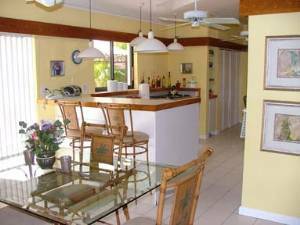 The house is well maintained & kept very clean for a reasonable rent. Joe was so helpful to us navigating the area, anything you need is not far away. Enjoy! This is a charming home, supplied with many unexpected amenities. It surpassed our expectations, particularly the lovely pool and backyard. Comfortable (every room had a ceiling fan and tv) and very well cared for, this house will definitley see our family again! November 24, 2006 Reviewer: Dallas Sakals From: Freeport PA.
Joe was extremely friendly and helpful. The house was perfect and the pool was great. We also liked the location of the house and the area, which was very clean and safe. Thanks Joe!! Cheers, the crew from down under!!! This house is awesome? We had the best time. I felt like I was at home. The owners are wonderful, the location is wonderful, everything was wonderful. I can't say enough. Please feel free to contact me with any questions. When we arrived the door was opern A/C on ,A wonderful welcome. We were with 4 grown up boys and there were plenty of beds, The king size bed for my wife and myself was very confortable. The house is very well equipped for all purposes. The swimming pool is wonderful. The house has a perfect location the Keys and Miami. The nearby shopping center has a well equipped Publix supermarkey and a very nice R.J. Gators restaurant. We really enjoyed our stay. you are very helpful. The house is nice, great location. I hope we can see us summer 2007. This house has every amenity you need. 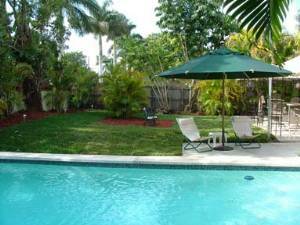 It is centrally located to Coral Gables, Key Biscayne and the Everglades. Key West is just a couple of hours away. You can not ask for anyone nicer or more helpful than Joe Sciascia and he lives right next door if you need anything. 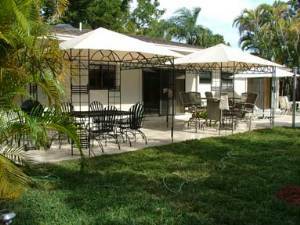 Stay here because you will not do better than this rental in Miami/Dade. July 5, 2006 Reviewer: John Spaw From: Lake in the Hills IL. "The Perfect Getaway" The house was nice and well-equipped. 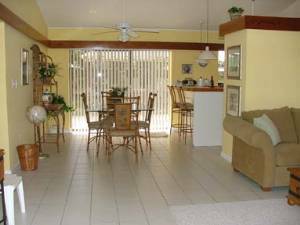 It is located in a very nice and quiet neighborhood with access to malls, the zoo, and of course South Beach. Mr. Sciasco was a great person and I appreciated his kindness. Anytime I needed anything, whether night or day, he made himself available. I would definitely rent this property again. We had a wonderful stay at the house. The accomodations were clean and comfortable. The backyard was very pretty and we enjoyed the use of the pool and the gazeboes. We recommend this house as a vacations base for any couple or family. We hope to return! Excellent accomadations, Very well equipped, Beautiful back yard and gazzebos. Extremely clean and efficient. Highly recommend this home if you are planning a trip in the Miami area. Joe lives next door, a great source for everything. This home is perfect for any vacation. We stayed at this home for 8 days in the beginning of January. The house has everything you need! The neighbourhood is excellent!! This place was by far the nicest place we have ever taken our family! Joe is an excellent resource, and he lives next door!!! If you need anything, Joe has the answer. Thanks for providing such a wonderful place for our family to have its vacation. If you thinking of booking this home for holidays, and wish to speak to me, my number is listed in this comment. February 25, 2006 Reviewer: Mary Pat Treuthart From: Spokane,WA. friends and family who plan to visit South Florida. We stayed in this house for 5 days recently while attending a family wedding in Miami. The owner, who lives nearby, is friendly and helpful. The location was ideal for us. More important, the house itself was well-equipped and quite comfortable for five people. We particularly liked the fact that there were a number of separate spaces inside (with TVs! )and out that allowed a sense of privacy for each of us. We would definitely recommend this home to friends and family who plan to visit South Florida. Wow what a great vacation! The house was neat and welcoming with many added details to make one feel at home down to the hospitality baskets in the bathroom . The pool was the highlight along with its well lanscaped backyard was where we spent most of our vacation. We are making this our vacation home. We hope to be back this April. Joe, our host was really nice and helped make our stay really special! Very relaxing and enjoyable holiday, the house came up to all expectations according to the descriptions received. It was well furnished, the gardens and pool were perfect for adults and kids and the beds comfortable! We would strongly recommend it to prospective guests, the area was peaceful and well situated for access to Miami attractions and the Keys/Everglades. We had a great week in this house. The kids loved to have their own room, private swimmingpool and lots of space. Compared to hotel solutions, this is a real winner! Thank you for your hospitality and all your help!! Stayed at this wonderful property twice during winter 2005. Interior is well furnished and clean. Back yard is attractive and the pool is kept clean. Will be returning again this coming January. This is a great vacation spot and I'm certain that I'll use it again. My friends and I celebrated my best friend's 35th birthday in Miami and what a treat it was to have everything we needed all in one place. 6 of us slept comfortably and enjoyed the pool and the beautiful landscaping in the backyard. The neighborhood was quiet and a great place to go for a short or long run (for those who love outside exercise)! Highly recommended!! Totally enjoyed the house and all of the amenities. You literally just need your toothbrush here. Loved the back yard and the neighborhood was very safe and secure. Will be back! Have just had a glorious week in Miami. The villa is ideally placed for everything and the villa owner (Joe) is friendly, welcoming and full of tips on how to enjoy your stay. Would recommend to anyone. The private pool is the best ever, though in the evening you may need insect spray if you are very fair skinned. It was lovelly to barbeque in the delightful gardens after a hard day on the beaches! We highly recommend this vacation home for families. You'll love the safe, residential setting, the well-appointed interior, and the lush, tropical outdoor pool area. Everything about this home says that the owners care about you having a great vacation experience. We can highly recommend this vacation home to other families. It was well cared for, well decorated, and had the most comfortable beds we've ever slept on. What struck us most profoundly, though, was the owners' attention to detail. At every turn we felt like they were expecting "guests," and not "tenants." This attitude showed through in many areas: a well-stocked kitchen, plentiful linens, a well-manicured lawn, and nice extras like a booster chair, books, and games. The large, very clean pool was nestled in the midst of a lush, tropical setting that just beckoned you outdoors. Added to this was an abundance of seating and covered dining and bar areas, making it perfect for living out the "Florida lifestyle." The location was ideal; in a safe, residential area, but close enough to everything we wanted to see and do. We will visit Miami again, and we'll stay here. We lived in feb. - march 2005 two weeks in this vacation home and we were very satisfied. The house was nice and everything worked fine. We swam in the pool and enjoyed very much of the yard too. It was nice to sit and enjoy the sun. The neighbourhood was safe so we can recommend this vacation home.